Freedom or A Prison For All . .
Our nation was built on inherent rights which serve as the backbone of human freedom, but those become meaningless when citizens no longer hold themselves to the standards of behavior necessary to maintain such freedom! It is indisputable, people simply cannot do whatever they want without regard for the consequences. There is freedom, as we know it from the day we are born, but with maturity, we have to learn to be lawful and civil to dwell with one another sans chaos. Self-discipline and self-control are essential counter-balancing measures for people to live lives which shun the additional restraints other men seek to place upon them. Someone or some other entity (like a government or a law-enforcing body) always step in to take up the slack for our lack of self-control and self-discipline. And every time that is necessary, a bit of our freedom is eroded! Thanks to the eroding behaviors of the lawless, a free society like ours can no longer maintain the same state of freedom which feels comfortable for the entirety. No man is able to decide for another how he should live his life, but that is exactly what happens in a society in which morality and civility decline! With fewer of us caring to self-regulate our behaviors and accepting personal responsibility for those errant choices we make, external control by some other entity becomes a dire consequence we all must then endure. We all must endure more laws, more regulations, more restrictions and more controls upon our freedom and choices, even though the chaos still grows more noticeable from the burgeoning lawless portion of our society. What is obvious is that the lawless already not obeying laws or self-controlling their behaviors will not respond to even more controls and laws! The answer to our societal problems is always found within each individual, making them responsible for their own actions and behaviors is essential. No one else has the right to say for another how their life is to be lived, unless and until that person has ceded their own self-control and self-discipline by a choice or a series of choices. Otherwise, what we have, as a result, is a national “prison” of laws, restrictions, regulations, and rules which bind the law-abiding right along with the lawless. That is why “we” should stop asking for more laws and controls to be placed upon society as a whole from a faceless, growing government of gigantic bureaucratic agencies unable to keep themselves in check. “We” should start calling for enforcement of the laws already on the books and accountability for those who are truly at fault when laws are broken. If you consistently enforce the value and necessity of morality, ethics, civility, and insist upon lawfulness by insisting that people are held accountable and pay their debt or recompense to society, a society stands strong against the chaos of freedom left unchecked and unbalanced! And this standard must be set from the top down at a universal Federal level all the way down to our communities and households! Each and every single one of us must be a responsible participant and each one of us must be accountable for our choices. Only those who are unable to self-regulate and self-discipline, such as children prior to maturity, are excusable for not exercising self-control. 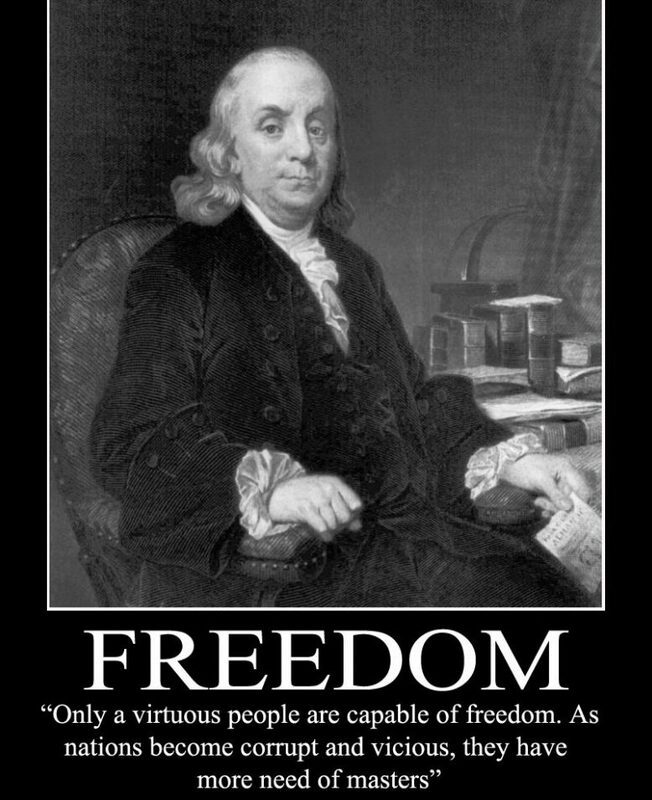 Such freedom as is inherent in us is hard to restore once bound and restricted! And if we lose our freedom here, God help us and the world!